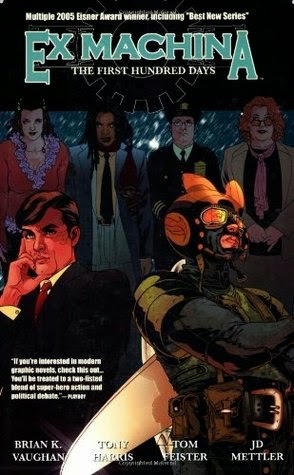 A review in 10 words (or thereabouts): Iron Man meets the Rocketeer, meets Siri...masked vigilante turns New Nork Mayor. Set in our modern-day real world, Ex Machina tells the story of civil engineer Mitchell Hundred, who becomes America's first living, breathing superhero after a strange accident gives him amazing powers. Eventually tiring of risking his life merely to help maintain the status quo, Mitchell retires from masked crime-fighting and runs for Mayor of New York City, winning by a landslide! But Mayor Hundred has to worry about more than just budget problems and an antagonistic governor, especially when a mysterious hooded figure begins assassinating plow drivers during the worst snowstorm in the city's history! But where to start? I knew I wanted a graphic novel series, so I thought I'd check out the offerings from an author that I really enjoyed the first time around. Brian K. Vaughn kept me very intrigued through Y: The Last Man, so I decided to give Ex Machina a whirl. At first glance, by the cover, I got very excited by the Rocketeer-esqu gentleman with his arms folded stoically, gazing off into the distance. I maybe kind of like the Rocketeer just a bit. While it's not exactly similar, I was able to find some commonalities that I really enjoyed. Some mysterious, glowing entity (which remains a mystery throughout volume 1) zaps our hero, Mitchell Hundred, leaving him with some pretty amazing powers. He can control just about an mechanical device, and he dreams up cool devices to engineer. This, of course, leads him into the vigilante business, which never quite seems to be the best of ideas. Anywho...Mitchel Hundred becomes The Great Machine, helping and serving, until the police Commissioner persuades him to leave his superhero days behind him (on pain of death). To which his response is to go into politics...which seems more dangerous. There are flashbacks to better understand who Hundred is and what he has given up, introducing allies and enemies that I'm sure will start to play a bigger role in the story. The illustrations are top notch, carrying the story quickly. The standing in a snowstorm panels are pretty impressive. That couldn't have been easy to pull off. All around, I'm excited to see where Ex Machina goes. Hopefully back to the skies with his jet pack thingy because that would be kind of awesome.